GPP game theory is always developing and will never be completely solved. The goal of these tournaments isn’t to just finish in the money but to finish at the top where ALL the money is. There are many important things to consider when building a lineup that can take down a GPP. One of the most popular strategies right now is to ‘Stack’ players from the same/team or game together in a lineup. Every NFL players performance is affected by the performances of others in any given game. Different players at different positions can be very correlated with each other so let’s go through the groups of pairings to decipher which positions make sense to play together. Lets first take a look at the positional combinations with the highest positive correlations to one another. These are unsurprisingly the positions with the highest correlation to each other. It’s relatively straightforward – If a QB passes for 350 yards and 3 touchdowns in one game someone has to be on the receiving end of those passes. Each yard a QB passes for increases the likelihood of a receiver getting reception yards as well. We can take advantage of this knowledge when putting together our DFS rosters. If we project Jameis Winston to pass for 350 yards and 3 TDs in a game we should also project Mike Evans to have a successful game. Last season Winston passed for 4,090 yards and 28 TDs while Evans had 96 receptions for 1,321 yards and 12 TDs. Evans was on the receiving end of 32.3% of Winston’s passing yards and a monstrous 42.9% of his TDs. The Winston – Evans example is on the higher end of the scale as it is quite rare to find a receiver with that high of a share of his QBs yards and TDs but they make for a perfect example in proving this point. If we go back to our earlier projection of 350 passing yards for Winston and calculate Evans to have his usual share of his yardage we can reasonably expect him to have 113 yards in the game and at receive at least 1 of Winstons TD passes. This puts Evans at 20.3 DraftKings points before we even take into account his receptions, which should add at least 6-7 points to these totals. Now of course, if Winston struggles Evans is also going to see his numbers take a hit and the entire lineup you built around that QB/WR stack will fail. This is the risk/reward that comes in to play when building GPP lineups like this but with all the money up top as I mentioned earlier you need to be taking on that risk if you want a shot at the big reward. QBs can also be paired with 2 WRs in certain scenarios but it is harder to determine when these situations arise. When they do it is a HUGE benefit to your team. Just think about it – if two wide receivers are putting up numbers that could potentially be on a GPP winning team the QB stats must also be GPP worthy. A good example of this came in week 7 last week – Jordy Nelson was out for the week as was anybody worth playing at running back for the Packers in a game against Chicago. The result was predictable – a sky high amount of pass attempts for Aaron Rodgers (56) and a similarly high number of targets for the top two remaining receivers in Davante Adams (16 targets) and Randall Cobb (15). Rodgers finished the week as the QB3, Adams was WR1 (at measly $3900 salary) and Cobb was WR6. This QB/WR/WR stack won some of people a LOT of money! The QB/TE correlation is not as high as you would expect when you consider that tight ends basically play the same role as WRs for fantasy purposes – you just want them to catch the ball for you. The main difference is that tight ends are much more reliant on scoring TDs (primarily from the red zone) for their fantasy points and aren’t accruing yards at the same pace as the WRs. Pairing a TE with your QB can add upside to any roster but there are only a few TEs who can be considered as the primary stacking options with their QBs and they are generally the highest priced on the board. If you are looking for a cheaper TE to fill out your roster the best bet game-theory wise is often to grab the TE from your QB/WR stack and hope that the yardage they are gaining will give your TE some red zone opportunities. To tie this in with our previous example you could have had some good weeks stacking Buccaneers tight end Cameron Brate (generally a mid-cheap priced option) with your Winston/Evans lineup. Brate was the TE12 in terms of receiving yards on the season but finished first at the position with 8 TDs, clearly benefitting when Winston, Evans and company had success moving the ball. 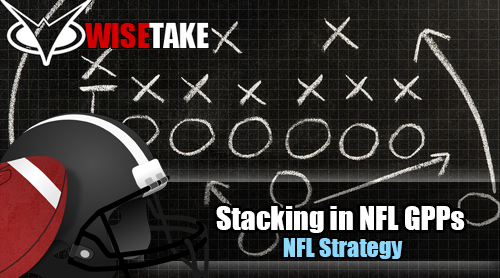 Another interesting GPP play is commonly referred to as a ‘Game Stack’ across the industry. The basic goal here is to find a game that shoots out and is far and away the highest scoring game on the slate. The hope is that as one team piles up points the other team is forced to try to keep up, generally leading to many pass attempts both ways. If the game happens to go into overtime – even better! The positions you are looking to target here are the ones involved in the passing game – usually a QB/WR combo on one side and running it back with an additional pass catcher on the opposing team. Even a QB/WR/WR/oWR stack can work if the game is high scoring enough. To find these games you generally want to find two strong passing games matched up against each other, preferably if they also have poor secondaries. Week 1 had a perfect game for this last season – Oakland at New Orleans in the Superdome. A Drew Brees – Brandin Cooks – Willie Snead stack was the way to go as each player surpassed 30 DK points. Amari Cooper was the beneficiary on the other side as he had 137 receiving yards in this 35-34 game as Oakland had to keep up with the offense of the Saints. Just keep in mind that the full game stack is another risky play as the majority of your roster will be under performing if the game doesn’t score as expected. It is also important to know which combinations to avoid in DFS. If the success of a certain player will have a negative effect on the success of another you should not be rostering both of them in the same lineup. These negative correlations can be between teammates as well as players on the opposing teams. Let’s take a look at some of these must-avoid plays. The standard rule here is simple – don’t roster a DST that is playing against any of the offensive players on your roster as any points that the offensive players score will have a direct negative impact on the DST. The most important positions to avoid playing against your DST are the opposing QB and his receivers. It stands to reason that a teams WR and their RB have limited ceilings together. Any RB touchdown takes away from potential WR points and vice versa. When a team is leading a game they are more likely to run the ball to control the clock and when they are trailing they are more likely to pass to try and catch up. Due to these play-calling tendencies the fantasy points available tend to vary depending on game-flow. While you can’t always predict how the games are going to go (though this wont stop us from trying), you can more accurately guess what positions will be scoring points based on game flow. With our first or last attitude when it comes to these GPPs you need to take a stand with the way you think the game will play out and base your rosters on that. The rest of the scenarios we are trying to avoid are between player on opposing teams instead of different positions on the same team. The strongest negative value between positions that don’t include the team defense is clearly between opposing running backs. The logic here is that if one RB is having an excellent day scoring wise his team is likely ahead and game-flow is forcing the opposing team to go to the air. The better one running back does also will slow the pace of the game down and limit the amount of plays the opponent gets to run. Every once in a while 2 RBs will have extreme success in the same game but this is almost always dependant on big plays and work in the passing game. A great example of this was in Week 10 of last season when Ezekiel Elliott and Le’Veon Bell were the 2 highest scoring backs of the week despite opposing each other. Elliot had 2 receptions for 95 yards and a touchdown in that game and Bell had 9 receptions for 77 yards and a TD. They both scored the majority of their points as receivers, explaining the end result. Correlations are everywhere in fantasy football and that means stacks can be very profitable as long as you are building them correctly. The passing games are the areas you want to target the most. QB yards result in receiver yards and QB TDs result in receiver TDs. The passing game takes away from the running game so when you put your roster together it is logical to pick one or the other. As with any successful GPP strategy there is a lot of risk involved here so you can’t be afraid to finish last a few times on your journey to finishing first!